My clients keep asking me about plantar fasciitis and is there anything to be done? Yes! There is a lot I can do to help you either with your diagnosed plantar fasciitis or any other unspecified heel, foot or ankle pain or discomfort. This is one of my specialties and usually pretty easy to fix. Question number 2 is usually (and it should be) that how many treatments is needed to 'heal' plantar fasciitis? That is a bit harder to answer without knowing what has happened to the ankle (yes, an ankle is always involved), is there more muscular or ligamental changes and what is the current state of inflammation. If there is an acute inflammatory processes going on (that means there is pretty severe pain), that needs to be dealt with first, before we can really treat the area of pain. But that doesn't mean we can't start the treatment, on the opposite. What ever part of the body I am balancing or treating, I will first treat all the surrounding tissues to 'make room' for the troubled part of the body to accept healing properties and lymphatic fluids to do their cleaning. In case of a foot issue that means concentrating on the muscles and tendons on your shins and calves.You can read more about the ankle on my last post, all that is valid with plantar pain! But the deeper (or original) reason for the discomfort could be found actually anywhere in the body, so there is no treatment plan without going through the whole body at least once. 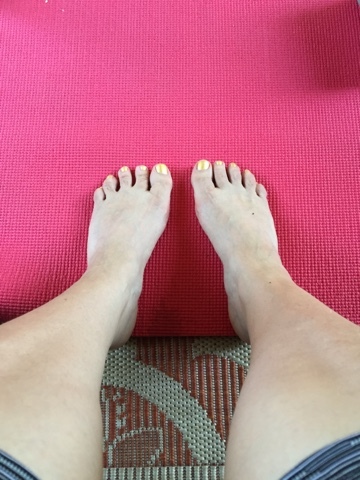 With plantar fasciitis there is a pretty effective stretching program for you to follow, so I will be teaching that too, so you can fast up your healing process. But remember, stretching is much more effective if the tissues are relaxed, bones in their right place and muscles brought back to their normal length. An answer to the question number 2 will always be an estimate, but I have been able to help my clients with these issues in 4 to 10 treatments. Sometimes we have concentrated to relax the foot for a half an hour twice a week for a couple weeks, before being able to rally work through the muscles of the calves and shins. Some clients have been training for a marathon, so we needed to schedule the treatments a bit differently: you just can not run 16 miles the day (actually 2 days) after the treatment! In Kata's Way the key is, that Balanced is Painless and on our way to the whole body balance there is some steps forward and backward. Pain is your body's cry for help and we have to respect that and proceed accordingly. But, if you can not see ANY improvement after 3 sessions, we need to re-consider our treatment plan and if Kata's Way is the best suitable way for you. I wish to see you soon and find a right way to help you. This is Kata's Way and it means Balanced is Painless! P.S. I also offer an excellent, PAINFREE and most beneficial foot reflexology done in my way; half an hour ($40) or 45 minutes ($60) session available. Check the pricing for 3 or 5 series.